We hope you will be inspired by our site to learn more about and support us in conserving seahorses for generations to come. We are a small but dedicated and world leading charity for seahorses and the natural world that reaches right around the globe. We can only achieve what we do by working with others and by working in partnership with nature. By taking this collective approach we can all make a difference. Please take a look through our website and enjoy the work we do, only made possible by our amazing team of volunteers, who are the true backbone of our charity. We hope you will find the site informative and understand more about the problems facing our natural world, especially seahorses; whether that is the loss of seagrass at Studland or the horrendous curio trade. Thank you for reading our site and if we can help please do not hesitate to get in touch. We urgently need to your help to challenge the Secretary of State over the illegal issuing of an extended drilling license in Poole Bay which may have been responsible for the deaths of 4 dolphins, 1 seal and 2 seahorses. If we are successful in our challenge it will stop this happening again. 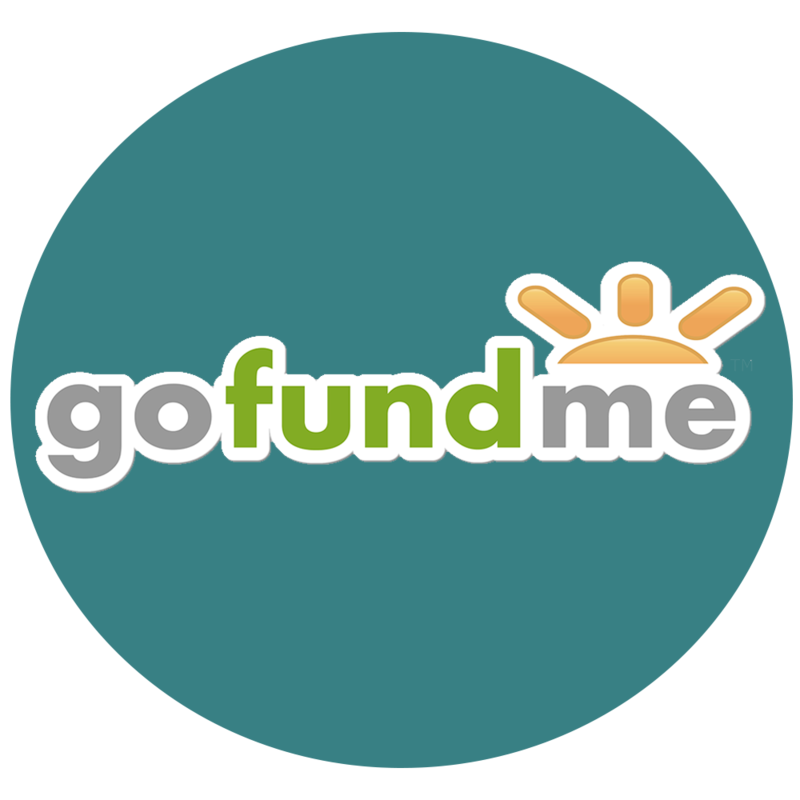 Our Solicitors, Harrison Grant of London have done a lot of the work free of charge for us (Thank you so much) but we are now entering that stage where there will be costs and so we are trying to raise £12,000 to cover this. Time is running out over the period we have to make this challenge and so this is a matter of urgency. Please can you share this appeal on all the social media you belong to and emphasise the urgent need. Many thanks for all your help. Click on the poster image to the right,l which was kindly done by a student form Bournemouth University called Stephen Harper (thanks Steve)to go to the campaign and please donate, no matter how small it will help. Have a look on our divers page for the latest dates and venues for the courses, click on the button below. 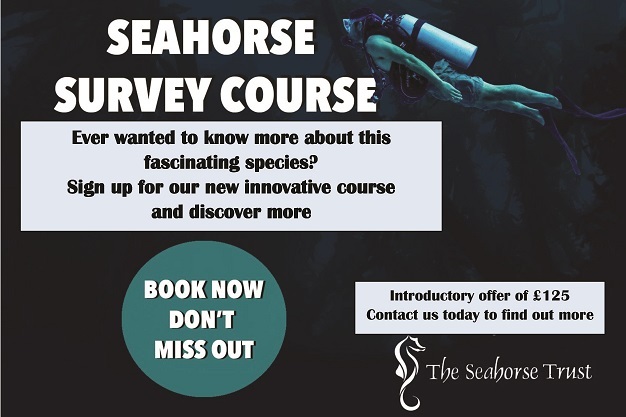 Please have a look at the link to the left (just click on it to go to the site) and see more details of the course and please pass this link around to all your friends on social media and try to get them to explore the world of seahorses. No matter where you are in the world we need to know about your seahorse sightings and so if yiou can e-mail us on WORLD SEAHORSE SURVEY with any information and/or pictures that would be great. Alternatively if you could fill out our online survey form (link below) and e-mail us any pictures, we can also add that to the worldwide databases we run. At present we are campaiging to raise funds to design an interactive seahorse survey database and map to allow seahorse lovers to see roughly where seahorses and what species are found around the world. 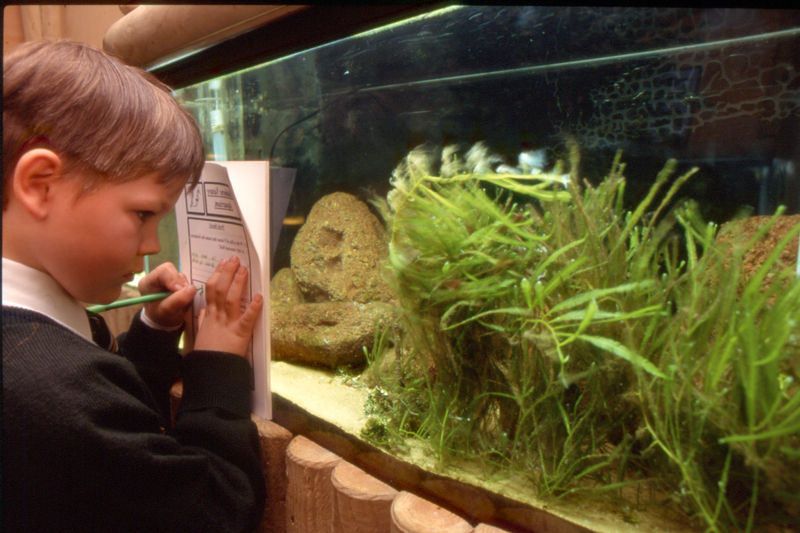 We are planning on building The National Seahorse Centre and we need your help, please. The centre will be a focus for our work and will become the headquarters of The Seahorse Trust. It will allow us to study seahorses, focus students and organisations and researchers into one place through our alliances and it will be a place for the public to come and understand one of nature’s most amazing animals. To do this though we need to undertake a feasibility study to look at potential funding, partners to work with and where to situate it. We estimate the study will cost about £5,000 to and so we have launched a GoFundMe campaign to raise this. Have a look at this thought provoking film by Scubazoo, it clearly shows how amazing seahorses are and how they are under threat of extinction in Borneo. Please forward this link to as many social media sites as you can, to show the plight of the seahorses before it is too late. We can still do something about. The film can be found at Galloping Extinction: Last stand of the Seahorse and what a brilliant film it is as well. We would also like to thank Save our Seahorses in Dublin and Gillian Marsh TV in Ireland for their kindness in helping out on the film. 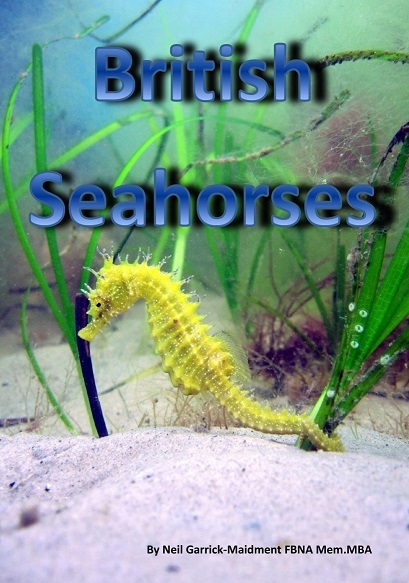 We have just produced a booklet on British Seahorses, so you can learn more about these amazing animals, these ‘Little horses of the sea’. It is full of facts and information about what makes these incredible fish be able to survive in our waters, how they breed, their beautiful daily dance and lots of other information about their unique behaviour and life in our waters. It is an A5 booklet in full colour and shows how enigmatic and incredible British Seahorses truly are. To buy a copy please e-mail BRITSH SEAHORSES and order a copy and you can pay through our donate button on this page or by sending a cheque for £4.99 (Including postage and packaging) payable to The Seahorse Trust to the address on our support us page. 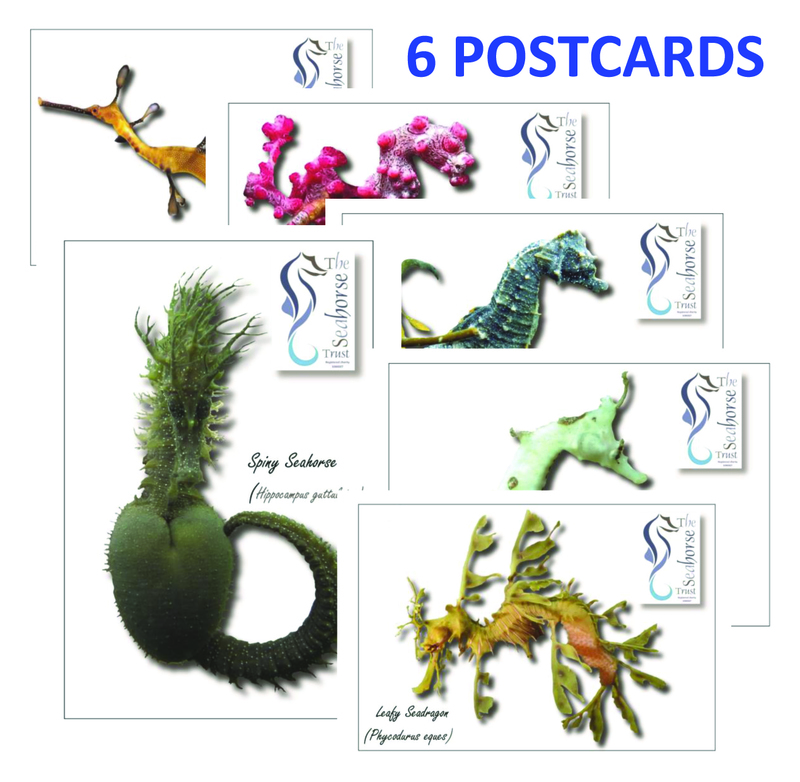 This stunning set of images featuring seahorses and seadragons has been made into a series of 6 postcards bound together. They are for sale for £7.65 (incl. 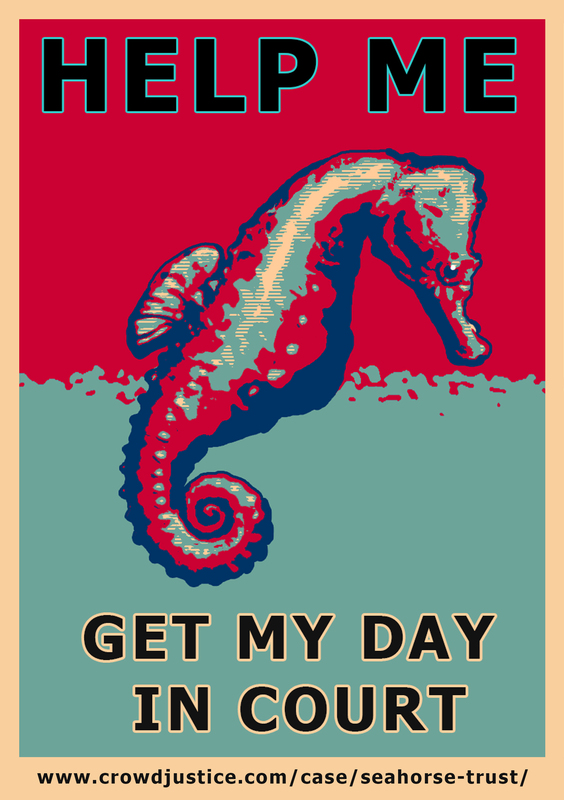 P&P UK only) withn 100% of the profits going to the work of The Seahorse Trust. The images have been kindly donated by the photographers for the use of the trust to aid its work and we would like to say a massive thank you to them all. Click on the Ko-Fi logo to the left to make a small donation that will make a big difference to our work.